“Ma! We made you something special.” For some reason those words caused my heart to leap in dread, instead of the intended anticipation. “Guess what it is, Ma?” Nechy asked eagerly. Before I had a chance to venture my guess, Yosef, with all the impatience of a three year old, blurted out, “Hot cocoa. We made it ourselves,” as he thrust the cup into my hand. Hot cocoa, indeed. In my fleishig Stoneware mug. I only have one microwave, and yes it is (or was) fleishig. Oh brother. The sheer glee on their faces made me swallow my instinctive scolding and instead beam right back at them and thank them effusively for the token of love that wreaked havoc on the kashrus of my kitchen. With one hand tucked into each of my own, and Faigy toddling close behind, I proceeded to give them the long–overdue tour. Opening each cabinet and drawer, lifting them up individually to peer inside, we slowly made the rounds. After ensuring that they had digested all this heavy information, we crossed the kitchen. “Here is Mommy’s fleishig side: fleishig pots, fleishig dishes, and fleishig cutlery.” Open, peer, shut. Repeating the process one last time with my pareve cabinet, I thought we were done, until Nechy’s ever-vigilant eye caught sight of my deepest secret, tucked away in a remote corner of the kitchen. “But, Ma, treif?! You know we don’t eat treif in this house!” The look of reproach in their eyes actually made me squirm. I opened the incriminating cabinet gingerly, as if my close proximity to items of such dubious kashrus validity could render me treif. There they were, staring at me accusingly, daring me to finally ascertain their fate, one way or another. My milchig colander had just joined this morning, after I caught Faigy hard at work on the kitchen floor, industriously smearing it with the contents of a full bowl of cholent Yosef had so generously provided her with. In the spirit of perfectionism, she managed to cover every single one of those tiny holes before I whisked her away. The milchig spoon Yosef had eaten his chicken soup with last night for supper, the milchig ladle my husband had accidentally dished the soup out with, and the pareve beaters Nechy had used to make “ocean waves” in her bowl were yesterday’s proud additions. I showed my children each piece patiently, describing, and at the same time reliving, the drama that had relegated each individually to such auspicious quarters. “It’s okay, Nechy.” I halted what I knew could be an endless flood of words with a reassuring hug. She seemed so contrite I had to feel sorry for her, especially in light of the fact that my somewhat hysterical reaction at the time of the incident had been punishment enough. Nechy looked a bit thoughtful, and Yosef seemed quite dazed. As for Faigy, she was busy shredding her cheese onto my fleishig broiler. I took a deep breath and then gently guided her away from the oven and toward safer territory. Yes, I want a kosher kitchen and I take my role as a Jewish housewife quite seriously. However, I constantly have to remind myself of my equally important role as a Jewish mother, molder of future generations. In order for my children to grow up valuing and treasuring the laws of kashrus, I have to ensure that their earliest encounters with kashrus not be fraught with tension, frustration and anger, but rather with patience, acceptance and love. In that issue I told you how I got this job and why I like it, and also how I’ve used my position to help bring back lost souls. This year, I am back in KASHRUS to tell you my personal secret, but we’ll get to that soon. You see, you first have to understand the people that I deal with. These are kids who don’t go to yeshiva and never have gone. Most of them are not from kosher homes. These kids basically never had a positive Jewish experience, let alone in an Orthodox manner. But, for two months I have these kids and I work with them. It’s not my job, but I make it my job. Anyway, I spend much of my time talking to the kids and seeing to it that by summer’s end they’ve finally had a good experience in an Orthodox environment. How I accomplish that and why my kids change (some a little and some a lot) is the secret that I have to tell you. In 2009, we had a small Shabbos minyan at camp. When I started, the office had told me that I’d be lucky to get even a minyan - out of 800 people - but I persevered and by summer’s end got over 40 every Shabbos. In 2010, that number just about doubled. We were getting over 80 on Shabbos, and they were into it. How did I do it? That’s my secret. In a word, empowerment. I gave them the minyan, lock, stock, and barrel. They set up for the davening, and they set up the kiddush. They give out the kibudim. They daven. They speak. They even ran around and collected money for more siddurim. That’s the whole secret. They take possession of the minyan. Now it’s theirs. It’s simple. Give the kids the opportunity to run the show and they’ll get involved and even be mekarev themselves along the way. When I was growing up, every shul had a Hebrew school and every shul had a junior minyan. The Agudah shuls had their pirchei minyanim. And the Bach shul in Long Beach, New York was famous for running a shul that was fully led by the young folks, not by the adults who davened there. And, you know, it worked. Many of us were those kids and we were drawn in by participating. Today, it is rare to find a Hebrew school in an Orthodox shul and the kids, well, let them be satisfied with an annual aliyah, if we have one for them. And the girls, there is little that they can do. Now, I am not one of those who promote women’s lib and women rabbis. No, no! But, the girls cannot be forgotten, not if you want them to keep coming to shul and to build up the next Jewish generation. Our bubbies didn’t need it, but our daughters and granddaughters do need to see that they are wanted and needed in the shul. Anyway, in my minyan, I have carved out a place for everyone who comes. And that is why, with no yeshiva education and no parental support, these kids are finding religion for themselves. “But, Al, isn’t there something else?” you ask. Yes, I have another secret. I make Yiddishkeit fun. We put out cake and soda for kiddush, stuff the camp won’t give them, so that the kiddush is special in their eyes. I daresay that the food makes the kiddush go down well. And, during the week, I also spoil them. We wrap our foods in little baskets and dramatize our meals — the chef loves it — and we keep the kids happy. “You mean this is kosher?” they’re always asking, because it is fun. Yes, yiddishkeit can and should be fun. At camp, no one shoves religion down their throats. It isn’t, “you can’t do this,” “you must not forget to do that.” It is just plain fun. Yes, no yeshiva background, no parental support, and miraculously they can flourish. But the camp is great. They back me up all the time. Now, what did they do last winter? They built a $300,000 kosher kitchen, actually two, a dairy and a meat one. That investment, in these days when money is so very tight, shows the kids that kosher matters and that they matter too. My job is easier and my message goes farther. You say that at the end of the summer it all washes away. It’s not so. “If it is at all possible, I will.” And I thought to myself, these kids are like my kids, no, like my grandkids. If it costs a bit of money, I’ll still go for it. “A Tanya?” I asked, absolutely floored by his request. This boy had never spent a day in a yeshiva. Orthodoxy was totally foreign to him. Why is he asking me now for a Tanya? Then I realized. He just started college in upstate New York. I’ll bet he met a Chabad shliach up there and developed a rapport with him. Now he wants to come to the shiur with his own copy of Tanya. And another Jew is choosing yiddishkeit, away from his family, all on his own..
Now, if only I can spread my secret. “So how much will it cost us?” they asked. What I didn’t tell them is that, if I go, then I will know that it is kosher - really kosher - and then I would know that they had Pesach - a real Pesach. That’s why I go back every year - to reach some new souls through fun and empowerment. What is most striking is the “OU” statements on pages 28 and 29. It seems, to this writer, to be a clear warning to avoid eating sardines, unless they are skinless and boneless; otherwise, you will need to pick up each sardine, open its skin, and remove the stomach, and, I suppose, wash off the sardine and thoroughly clean the knife that was just used. The kashrus of sardines is really a complicated one since, unbeknownst to most people, there really are two problems with sardines: the presence of krill which may be located in the stomachs of the fish and of anisakis which may be found around the internal organs, in the gut of the fish. With Brunswick/Bumble Bee sardines, consumers had found krill loose in the can. Needless to say, they could just as well be found also inside the stomachs of the fish, since sardines feed on krill and the stomachs are not removed. The other problem, that of anisakis being found in the guts of Gefen sardines, is a new problem, one that threatens the long established balance regarding fish in general. 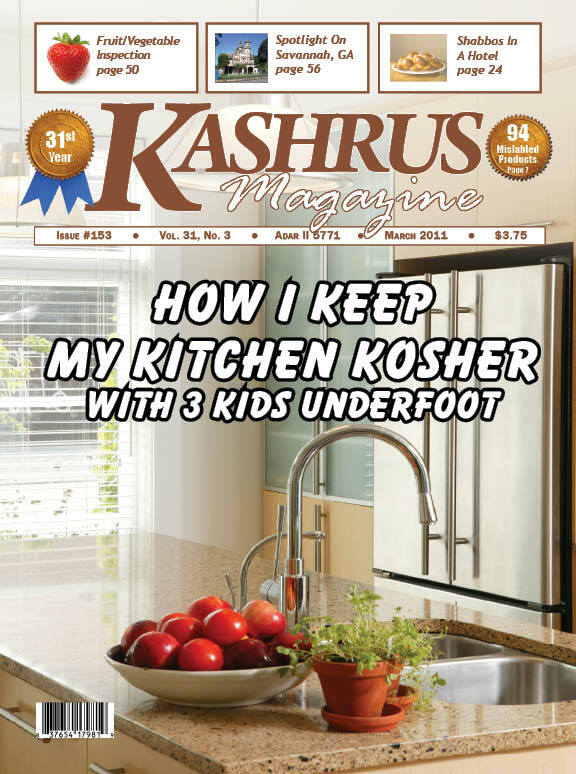 For a long time, there has been a debate between various rabbonim and likewise between various kashrus professionals as to whether anisakis, a fish parasite which is usually found in the flesh of fish, is of any halachic concern to us. The recent tumult over wild salmon is over anisakis infestation. Wild salmon is now known to contain many nematodes (worms) called anisakis. The debate is whether the Talmud and Shulchan Aruch permit the worms found in the flesh of the fish. Most U.S. kashrus agencies permit the use of salmon despite the presence of anisakis, while most of the badatzim and other leading kashrus agencies in Israel forbid eating wild salmon. But that battle was over anisakis that is found in the flesh of fish. What happened with Gefen sardines is that these sardines from Portugal have a serious infestation of anisakis in the gut of the sardines, the cavity where the organs are found. The Talmud and the Shulchan Aruch are clear that worms found in the fish in any part other than the flesh are 100% forbidden to ingest, hence the necessity to remove the gut from these sardines. What the kashrus community will now have to address is which sardines have krill problems and which have anisakis problems, when the anisakis is found in the fish’s gut. What complicates this study is that there are more than twenty different fish that can be called sardines. (Sardines are actually a part of the herring family.) Consider also that sardines are canned where they are caught and you will see that they come from many different parts of the world. Each water has different challenges. We have now become aware of just these two, but more issues with sardines may surface in the future. Usually, we advise people to ask their rabbi for guidance. In such matters, however, even rabbis will have to ask the various kashrus agencies what they know about these matters. We hope to report further findings when they become available. The “OU” has been monitoring sardines since 2005 when a consumer found krill in his Brunswick sardines. Other than these lots at these two companies, they are not aware of either type of infestation in sardines. Some want to raise a question as to how the sardines can be kosher if they have been cooked in the same can with their krill-laden stomach intact, since the food in the intestines of fish are possibly 6-7% of the weight of the fish. Our position, at this time, is that, while 6% or 7% of a sardine can may be the contents of stomachs of the fish, that doesn’t mean that all 6% is definitely krill. The krill may be sufficiently digested so as not to render the fish forbidden. There is an additional halachic concern in that when a non-kosher substance is tightly packed into the guts it may be called issur davuk, requiring not the normal 60 times the forbidden substance, but requiring 60 times the entire sardine, a virtual impossibility. In any event, the requirement to remove the stomach is a definite reason to avoid sardines. Personally, I cannot imagine anyone poring over these little fish, attempting to cut out all of the guts. It is quite unlikely that consumers will do so. Furthermore, two months from now nearly everyone will have forgotten the statements by the “OU” and by the Volover Rav (pages 28-30). No, I think they have permanently made at least this writer an avowed skinless and boneless sardine man for the foreseeable future. I always like that variety better anyway. The “OU” has informed KASHRUS that the Bumble Bee company is cooperating with them in an effort to remove batches that contain significant amounts of krill from the brands bearing an “OU”, such as Brunswick®. Also, the “OU” label will be removed from the Beach Cliff® brand so that fish that may contain whole krill can continue to be utilized and sold to consumers without issues. KASHRUS wants readers to understand that despite all efforts by any company and any kashrus agency, it is impossible to guarantee that any can of sardines, other than the skinless and boneless ones, contain no krill. While sardines eat plankton, they eat krill as well. When sardines are caught after eating krill, their stomachs will contain them, whether fully digested, partly digested or completely undigested. For this reason we ask readers to contact sardine manufacturers to investigate the possibility of complete removal of all stomachs even for varieties that still have the skin and scales. It is interesting that, as far as I am aware, sardines may be the only fish being cooked with the stomach intact. Anchovies dine on zooplankton. Some zooplankton are larvae or very immature stages of larger animals, including mollusks (like snails and squid), crustaceans (like crabs and lobsters), fish, jellyfish, sea cucumbers, and sea-stars (these are called meroplankton). Whether these zooplankton are all visible or some are microscopic is worthy of further study. But, typically anchovies (of which there are some 140 varieties) are gutted before processing. The literature does not say that this is conclusively so. Consult the certifying kashrus agency to be sure. Some years ago the tuna industry was challenged when kosher consumers discovered that some brands cooked the tuna without eviscerating and so the contents of the tuna were cooked with the fish. Tuna also feeds on non-kosher fish and they remained in the stomach during the cooking. While an effort was made to see if the non-kosher varieties were digested before the cooking took place, this writer expressed concern that the one who checked whether the non-kosher fish in the tuna stomachs were fully digested was a mashgiach and not a marine biologist or other expert. I posited that a fish may look digested as you first see the outside, but inside the fish may be undigested. In any event, at that point in time, the tuna companies that did cook the fish before eviscerating them decided to adjust and eviscerate before cooking. Subsequently some of the companies changed back. It behooves all kosher consumers to inquire of the certifying agency whether a specific brand of tuna is eviscerated before or after the cooking. This week, while speaking to the head of a major kosher company, I asked him to consider reducing the salt in his products; they are literally over the top when it come to sodium content. I was impressed. He asked me how I thought that he could decrease the sodium. Since he asked sincerely, I collected a number of articles on the topic and emailed them to him. What follows are the ideas presented in those articles plus a few more that I have. Please note that the secular world (i.e. the non-kosher world) is addressing these health issues head on and they are reducing salt, sugar, trans-fats, and calories. It is being done voluntarily and it is being legislated. Let us take the lead in these changes, not just wait 10 years until they filter down to us through legislation. 1. The “Pyramid Approach” - Developed by scientists at Nizo Food Research, this is a natural method of reducing salt levels in cheese and meat products. It begins at the base of the pyramid with salt replacers, then with masking agents in the middle, and flavor enhancers and top notes topping off the pyramid in food production. The main concerns are flavor and aroma. Identification of aromas that create a perception of saltiness are crucial. 2. Bakers have started to slash salt by using ‘micro’ (microscopic) salt particles (5–10 microns). Trials have been conducted by manufacturers of sausages, crisps, sauces and bread, with soups and bakery premixes to follow. The accent on saltiness can really be accomplished with less. While the new SodaLo is more expensive than salt, it is competitively priced compared with other salt replacers. People don’t want to use potassium chloride, flavor enhancers, nucleic acid, yeast extracts and peptides. SodaLo is just salt, only smaller and very effective. 3. Companies are working pre-competitively by sharing information on the “best practices” to reduce sodium levels through formulation as well as process and manufacturing control. Some companies have already begun to reduce sodium levels with the launch of new reduced sodium cheeses and others are making reductions across their product line. 4. The New York City Health Department is bringing awareness to the amount of salt used in packaged and restaurant foods in NYC, and, with its National Salt Reduction Initiative, the impact of the city's actions will be felt across the country. It seems to be working. There are already 16 companies who have publicly declared their intention to voluntarily reduce the amount of salt they use.